Topic: Plans for a DIY ROV? Has anyone come across plans to build a do-it-yourself ROV, low budget? Not just an underwater camera in a housing, but remote arms with claw, mapping capabilities, camera, video, cargo retrieval, etc.? Seems like it might be a decent thing to design and/or build. Not just for yourself, but to sell. I'd love to have one, and now that the 2009 Treasure Expo & Trade Show is over I may have time to think about building one with a set of plans. 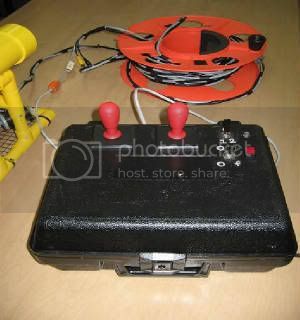 Re: Plans for a DIY ROV? Here is a great site to get started. 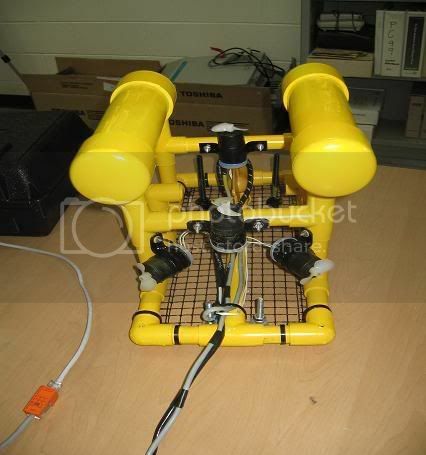 Steve Thone has been the inspiration for many DIY ROVs. I have built a similar version of the Sea Fox ROV and will post some pictures. Steve has taken it to the next level with Computer control. Good Luck and I will certainly post some picts soon. I built this ROV several years ago. It has made many dives with no troubles. It is camera only, but I only use it to spy on fish. Only problem is underwater orientation. I also tried a compass. No luck. I mark spots I want to investigate (underwater) using buoy markers with hi vis cord and follow the cord with the camera. Crude, but effective. I came across some of the picts of the ROV my Son and I built. It has proven useful to about 60ft and has a great image if water visibility is good. Thats the only problem here in SC, we have terrible vis. Less then 5 feet some times.? The vis only gets good when you get offshore 10-15 miles. None the less, it has proven to be a fun project! It's a modified version of the Sea Fox ROV in the book by Harry Bohm, "Build your own underwater robot." Here are some great ROV links if anyone is interested. This design can be built for less than $300. You can see the original version I built using the bilge pumps and the modified version wher I converted the bilge pumps to thrusters. I've attached some picture and animation of the whole project. The builder used a pivoting system for one of his designs which allows only two motors to achieve lateral and vertical movement.